This page addresses a part of the history of the Voynich MS that is largely ignored in most publications. It covers the time after the MS was received by Kircher in Rome (1665), until the time it was acquired by Voynich, not far from Rome (1912), i.e. the yellow bar in IMG: this graphical timeline. All this time it appears to have been in the hands of the Society of Jesus. Whatever we learn from this part of history is highly unlikely to help us either in understanding the purpose of the MS, or in unravelling the meaning of its text (1). This research has been made (and is still being continued) for its own interest. The bibliography relevant for this subject is included at the bottom of the present page and not in the general bibliography, since it is not of general interest for the remainder of this web site. For the time between Kircher last had the Voynich MS in his hands, and Wilfrid Voynich did for the first time, the MS appears to have been in the possession of the Society of Jesus in Rome. During this time, the Society was in considerable upheaval, as it suffered two suppressions, in the years 1773 and 1873, and experienced more difficult years around 1848. Many of their belongings were confiscated. This part of the history of the Society of Jesus in Rome is highly complicated due to numerous moves of libraries and archives, and a lot of secrecy surrounding it. A complete study of this is clearly outside the scope of the history of the Voynich MS, but it is still important for us to understand it as much as possible, because the Voynich MS was caught in the middle of it. It is the historical background for a still largely unknown part of its history. In the following, I will present parts of the history of the Society of Jesus, primarily in Rome, that could possibly be relevant for the history of the MS. This should not be be seen as more than a collection of historical items, and it is not meant to be in any way exhaustive. It is far from being a scholarly study of the history of the Society of Jesus in Rome. To compose it, I have consulted a large number of reliable sources about this history, but I did not yet have access to many others. As a result of the story that Voynich has spread about his discovery of the set of manuscripts that he acquired in 1912, it has always appeared as if the collection in which he found the Voynich MS was one that had been lost, and he was the one to re-discover it. This is now known not to be true (2). Still, some effort has gone in researching this aspect of the history (in particular lost collections of books, and a connection with Austria), and will be reflected here. The history of the Society of Jesus in Rome is set in a number locations, essentially all Jesuit establishments, and it is useful to identify these historical places at the start. (Additional modern Jesuit establishments are introduced further below). 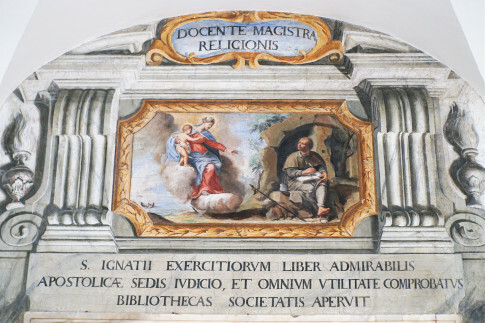 The Jesuits established several centres of education in Rome. The most notorious among these were the novitiate attached to the church of St. Andrea al Quirinale and of course their main college, the Collegium Romanum. The nearby German college also played a signficant role for the Jesuits after 1870. The main library was included in the Collegium Romanum. The main Jesuit church has always been the Gesù. Annexed to it was their main administrative centre, the Curia, in the so-called Casa Professa. A second important Jesuit church is the S. Ignazio, integrated into the Collegium Romanum palace. The famous museum of Athanasius Kircher was equally located in the Collegium Romanum building. 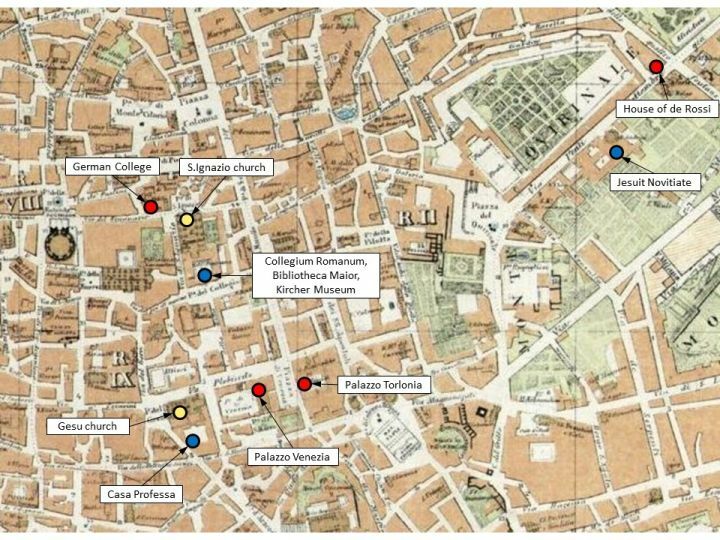 The figure below is from a map of Rome of 1876, in which I show the above locations, and a few others that will play a role in the following. Yellow is used for Jesuit churches, blue for other Jesuit sites, and red for non-Jesuit sites. The Collegium Romanum was established already in 1551 by St. Ignatius of Loyola. It moved to a large palace built by pope Gregorius XIII in 1584. Even though the college is no longer there, the building is still known as the Palazzo del Collegio Romano, with the main facade flanking the Piazza del Collegio Romano. One of the main sources for its history is Garcia Villoslada (1954). The Collegium Romanum included several libraries, one for each of the various disciplines: one for theology, one for philosophy, a third for rhetoric and finally a fourth for the lesser studies. Beside these four libraries there was also a fifth consisting of collections from important legacies. This was the Bibliotheca Major, also known as the Bibliotheca Secreta (from Latin: separate, to distinguish it from the private collections of individual Fathers or teachers). This had rather severe restrictions to access to the documents stored in it. Its main room was known as the sala crociera. One of the most important collections that helped to establish this library was the book and MS collection of the French humanist Marc Antoine Muret, latinised as Muretus (1526 - 1585). On his death, the collection was left to his homonymous nephew, who died at a very young age and left it to the Jesuits in 1601. A handwritten catalogue of books in the library of Muretus has been preserved and is now in the Vatican library as MS Vat.Lat.11562 (3). This catalogue has been published by Paolo Renzi (1993) (4). 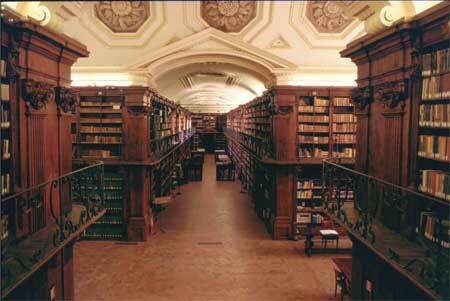 Several catalogues of the Bibliotheca Maior have been preserved, and are now in the National Library of Rome (BNCR). These catalogues only list the printed books, and no manuscript catalogue has ever been compiled. The catalogue with modern shelf mark Ant.Cat.21 is a thematical catalogue of 28 volumes, while Ant.Cat.23 is an alphabetical catalogue of 12 volumes. It was composed between 1754 and 1773 (5). The image shown above is of Vol.5 of the alphabetical catalogue. It shows that the shelf marks used in this library consist of a number, followed by a letter, followed by another number. Modern research by the staff of the historical archives of the Gregorian University in Rome (6) suggests that the first number marks a complete bookcase, the letter marks the individual shelf, and the second number is a running number on the shelf. The books would have been distributed over the different shelves depending on their height. The Casa Professa was a building attached to the main church of the Jesuits in Rome, the Gesù. 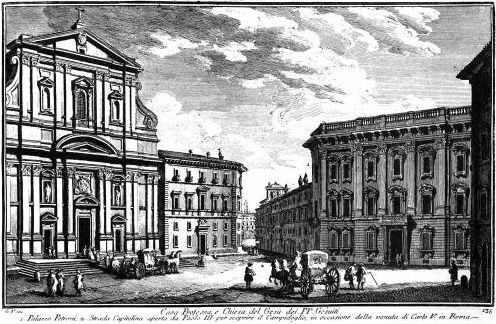 Both still stand, and they are shown below in an engraving by Giuseppe Vasi published in 1756 (7). The Casa Professa housed the Curia, which was the main administrative centre of the Society of Jesus in Rome and the residence of the Father General. It also housed the Jesuit archives, and an important Jesuit library, whose beginnings trace back to several members of the Gonzaga family (8). In 1651 a valuable collection of curious items was donated to the Jesuits through the testament of Alfonso Donnino of Toscanella (9). The Jesuits stored it in a more than 20m long corridor on the second floor of the building of the Roman college, close to the library. Athanasius Kircher was considered the one most appropriate for curating this collection. These are the beginnings of the Kircher museum, and over the years Kircher extended this collection very significantly. The museum became one of the attractions for visitors to in Rome in the 17th century. The idea of a printed description of the museum circulated already in 1656, and sometime before 1670 a Jesuit named De Sepi started the first edition of a catalogue (10). The frontispiece of this catalogue, shown above, probably represents the museum in its original location, but in 1672 it was moved to another, shorter corridor on the first floor. De Sepi probably died in 1674, after having left Rome in 1670, and never witnessed the publication of his catalogue (11). It was further edited by Kircher himself and issued in 1678, just two years before Kircher's death. The special importance of this first catalogue is that it gives a first insight into the collection of books contained in Kircher's museum. After Kircher's death in 1680 the museum was handed over to a Jesuit father who didn't properly take care of it, and it gradually fell into disarray. In 1698 Filippo Buonanni became the new custodian. The museum was again moved to a different location, this time a pair of corridors joining at a straight angle on the third floor of the same building, where it was to stay until 1870. Buonanni also published a more elaborate catalogue of Kircher's museum (12), but this, like all future catalogues, no longer listed any of Kircher's books. Kircher must have received the Voynich MS in 1665, but we do not know what he did with it. The above-mentioned catalogue of 1678 (see note 10) lists many of his books, in Chapter 8. It starts with a detailed list of Kircher's own published books on pp.61-65, and then mentions twelve bound volumes of letters collected over 40 years, and books in many languages, but not specifically the Voynich MS. It also does not mention several other manuscripts known to have been in Kircher's possession, which are still preserved today. This is clearly not a representative catalogue of his library, but rather a list intended to highlight a number of items. The reference to old manuscripts on parchment is of interest, and De Sepi did not mention them specifically. Kircher's collection of books, that would have included the Voynich MS, must have been moved to the Collegium Romanum sometime between 1705 and 1870. Garrucci (see note 13) also draws a map of the layout of the museum after 1698, based on details in the Buonanni MS. In the following we shall encounter several books and manuscripts that were clearly owned by him, including the above-mentioned volumes of correspondence listed in De Sepi (1678) (see note 10), which I shall henceforth refer to as the Carteggio Kircheriano. These will help us in tracing the various moves of book and manuscript collections. In 1773, due to pressures from secular governments all over Europe, and to a mounting wave of opposition from within the church, the papacy decided to dissolve the Society of Jesus. The archives at the Casa Professa were seized by Pontifical authorities, and were sealed off. Between 1773 and 1814, some of the documents kept at the Casa Professa were taken by cardinals and other individuals, and ended up in different collections (such as the archives of Propaganda Fide in Rome, the French National Library, or the Chapter Archives of the Toledo Cathedral, Spain). Pietro Lazzari (also Lazzeri), the librarian of the Collegium Romanum, joined cardinal Zelada, who was one of the main actors in the anti-Jesuit movement. The latter took some of the books (mainly prints) from the Collegium Romanum to his library in Toledo. Before that, Lazzari had published a book (14), in which he described details of numerous old manuscripts contained in the Bibliotheca Major. Russia was one of the countries that remained friendly towards the Society of Jesus, and it received meany exiles. The Jesuit Giuseppe Pignatelli S.J. played a significant role in preserving the society during these years. In 1814 the Society was officially restored. After this, part of the archival documents returned into the hands of the Jesuits, but little is known about those years. From 1824 the Jesuits could gradually retrieve their old possessions, including their churches and schools, and the Curia. The year 1824 (15) has become the break point between what are now considered the 'old' and the 'new' archives of the Society. As reported in a blog entry of the Historical Archives of the Gregorian University in Rome (16), sometime between 1824 and 1870 a large number of manuscripts in the library of the Collegium Romanum were rebound with new covers because the wooden boards that were part of their old covers had been infested by wood worms. It is almost certain that the Voynich MS was one of these rebound manuscripts. Details of its binding are elaborated on a dedicated page, and from this we see that not only does Ruysschaert report the rebinding of this collection (17), but also that traces of wood worms related to a previous wooden binding are clearly visible in the Voynich MS and other manuscripts that were acquired by Voynich in 1912. In 1853, the Belgian father P. Beckx S.J. was elected as the new general of the society. Beckx is directly associated with the Voynich MS, because the larger collection in which the MS was found had typescript labels referring to his library, as we shall see below (18). Because of this, his life and deeds deserve some attention. Fr. Beckx was already working in Austria before the expulsion of the Jesuits in 1848, and in that year he went back to Belgium. He was instrumental in restoring the society in Austria, through his influence with emperor Franz Josef I. From 1852 he was the 'provincial' of Austria, following the Russian Jesuit Jakob Pierling. Beckx and Pierling worked very closely together in Austria for many years. When Beckx was elected General, Pierling became the assistant for Germany in the Roman Curia, a post he kept until his death in 1870. Pierling's successor was Fr. A. Anderledy S.J, who was later to become Beckx's successor as General of the Society. In 1855 the Duchess of Sachsen donated her late husband's extensive private book and MS library to the Jesuits. The fate of this library is closely related in several respects with that of the collection that included the Voynich MS, so it will be treated in some detail (19). The bibliophile Giovanni Francesco de Rossi (1796 – 1854) collected a significant library of books and manuscripts with the financial support of his wealthy spouse Louise Charlotte de Bourbon (1802 – 1857), Duchess of Sachsen (from her first marriage). Like Beckx, she lived in Vienna for many years, but I have no record that they knew each other there. De Rossi's library was housed in his palace on Via del Quirinale 1, not far from the Jesuit novitiate. De Rossi insisted with his wife that, in case of his death, this collection of over 10,000 items should not be dispersed but remain intact (20). After De Rossi died, his widow remarried, and in order to avoid problems in case of her own death, she decided to donate the entire collection to the Jesuits in Rome, who stored it in the Casa Professa. In case of a temporary or partial dissolution of the Jesuit order, the Apostolic authorities may decide on the fate of the library, in order to keep it intact and together. This document was considered binding, not only by the Society of Jesus, but also by Austria and it would play a decisive role in the future of this library. During the first 18 years after the donation (i.e. until 1873), while the collection was in the Casa Professa, it was completely inaccessible. At this time, this collection was known as the Biblioteca della Duchessa di Sassonia. It was one of two libraries preserved in the Casa Professa. Beside the library of the Duchess of Sachsen, the Casa Professa also hosted its own library which was already mentioned above. Grafinger notes (see note 19) that some books were apparently removed in the first year of the Bibliotheca Rossiana’s storage in the Casa Professa, with permission of De Rossi’s widow. Some were traded with the library of the prince Camillo Vittorio Massimo, and some sold to the College of S. Ignazio. 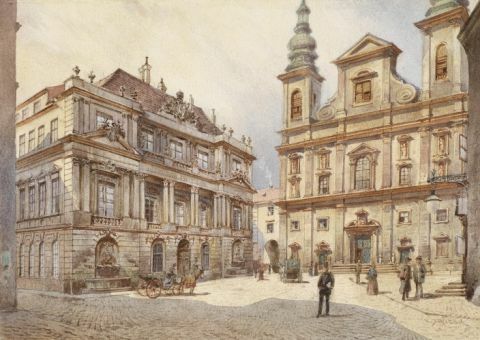 In 1869, the librarian of the Casa Professa informed the Hungarian Jesuit Vilmos Fraknói that the library of the Duchess of Sachsen included a manuscript that used to belong to the famous library of Mathias Corvinus (21). As a result, the Hungarian historian Flóris Rómer travelled to Rome the next year and had photographs taken of this manuscript, and of several other Corvinus manuscripts, including two that had been preserved in the Collegium Romanum library. He published the first photo of the remarkable frontispiece of one of these two manuscripts (22). In the summer of 1864, prince Marcantonio Borghese approached the Jesuit Alessandro Ponza di S. Martino, provincial of Rome, in order to allow the Jesuits to use his Villa, the Villa Mondragone in Frascati, as a college and home for children of Italian nobility. Both the general P.Beckx and pope Pius IX approved of the idea, and the Nobile Collegio Mondragone could start its activities on 2 February 1865, with 5 pupils, 3 of whom were Borghese's own sons. Alessandro Ponza becomes its first rector. The Villa would be sold to the Jesuits in 1896. 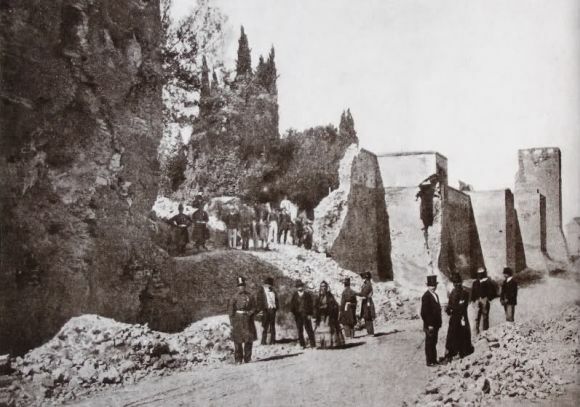 On 20 September 1870 the Piedmontese troops of Vittorio Emanuele II entered the city of Rome by a breach of the city walls near Porta Pia. A detachment of soldiers at once proceeded to the Casa Professa and took up quarters there. However, the occupants were not in any hurry to take over Jesuit possessions. The Jesuits moved the archives from the Curia to the basement of the nearby Palazzo Torlonia on Via della Riconciliazione (23). This palace was owned by prince Alessandro Torlonia (1800-1886), who was a great friend and patron of the Jesuits, and a close personal friend of P.Beckx. The palace would be demolished several years after Torlonia's death, in 1903. Initially, indications were that the various religious orders would not be affected, but in June 1873 the law relating to confiscations of Jesuit possessions was extended to the Roman province, taking effect on 20 October. One by one the Jesuit houses in the city were confiscated, including the novitiate of S. Andrea al Quirinale and the Gesù church with the adjacent Casa Professa, so the two libraries that were already mentioned above were at risk. By this time (in 1873) the archives had been moved from the aforementioned Palazzo Torlonia to the attics of the Palazzo Borromeo on Via del Seminario near St. Ignatius Church, which then housed the German college. The Collegium Romanum building, which had already been occupied and used by the Ministry of War until then, was annexed in January 1873. The archives of the General Procurator, which primarily dealt with relations with the Holy See, were confiscated by the state, and transferred from the Collegium Romanum to the State Archives, where they became the Fondo Gesuitico (Jesuit Collection). It was not until 1924 that they would be returnd to the Jesuits (see note 23). An important witness of the suppression of the Society and the confiscation of their property during the reign of P. Beckx S.J. was the Jesuit Father Paul Pierling (1840-1922), nephew of the Jacob Pierling mentioned above. Paul Pierling was the secretary of the Assistant for Germany (Fr. Anderledy, also mentioned above) in the Roman Curia, and was based there from 1871 to 1876. He recorded some of the events in a letter (24). Following are some excerpts of it (my annotations in square brackets) (25). It was as late as 18 October  that Father vice-superintendent of the Gesù received the official communication that announced the transfer of ownership [of the Casa Professa] on the 20th of the current month. In order to know exactly what was the point, we thought it would be better to ask for some explanations on the way the seize had to be done. The notary answered that each religious person was allowed to keep all his personal properties, but that the community properties were transferred to the state. For lack of instructions, he was unable to resolve the doubt brought up by P. Rubillon about assistants libraries, but, three days later, the positive answer came back and each Assistant was authorized to take away his own books. We walked immediately towards the great library. The absence of a catalogue caused a surprise, which ended when genuine acts proved that the catalogue never existed. Copies of these acts were taken and the Piemontese seals closed the doors above which we can see St-Ignatius of Manrèse, with the caption: “Liber exercitiorum S.P.I. bibliothecas Societatis aperuit”. The library of the Duchess of Saxony, which must be transferred by will to the Emperor of Austria, was sealed by a secretary of the Austrian legation, some days later. The fact that privately owned books were officially exempt from confiscation will play an important role in the following. It provided the Jesuits with a possibility to preserve books from their libraries from confiscation by the state. We read in Carini Dainotti (1956) (26) that about 4000 books were 'evacuated' from the Casa Professa, plus an additional 60 chests (27). Some of this must have constituted the 'private library of P.Beckx'. Ghiron (1882) (28) even reports that the newly established government was about to confiscate also this private library, but thanks to the personal intervention of King Vittorio Emanuele II, P. Beckx was allowed to keep it (29). The library of the Duchess of Sachsen, also mentioned by Paul Pierling, was, as we saw above, protected by the donation contract signed with Beckx, and was transferred into Austrian custody. It was packed into 53 boxes and moved to the Austrian embassy to the Vatican, in the nearby Palazzo Venezia. It would be shipped to Austria several years later (see also note 19 and note 27). 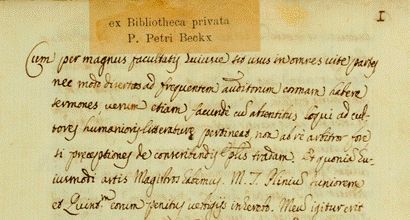 Before the day of the official confiscation of the Curia, P. Beckx had already said good-bye to his fellow Jesuits, and returned to the Belgian college attached to S.Andrea al Quirinale. In the midst of speculation about his next moves, a few days later he moved to Fiesole, to the Villa di S.Girolamo, which had been acquired for the use of the general by the Ricasoli family. Here the new Curia was established, including the modern (i.e. post-1824) section of the archives of the Society. It was to remain here for over two decades, and be the home of three generals of the Society. The Jesuit fathers in Rome received a pension from the new government, and 144 of them had to leave the city (30). 50 moved to two Villas that the prince Torlonia had placed at their disposal: one in Castel Gandolfo, the other on the ancient territory of Bola, between Praeneste and Tivoli (31). Several were accepted at the college of Mondragone, in Villa Borghese in Frascati. We further read in the biography of Beckx by Verstraeten (1889) (32) that on 13 October 1873 the historical Jesuit novitiate of St.Andrea al Quirinale was forced to close and had to be evacuated within two weeks. Prince Alessandro Torlonia immediately offered to continue the activities in his Villa in Castel Gandolfo (the Villa Torlonia). 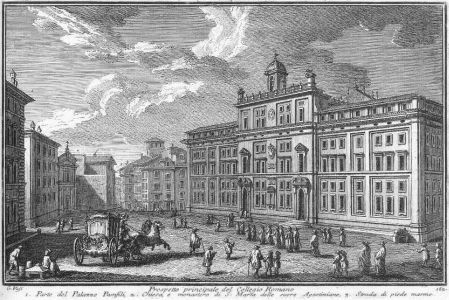 After the confiscation of the building of the Collegium Romanum the university activities moved to the above-mentioned German college in Palazzo Borromeo, and there the college would be known as the Pontificia Università Gregoriana del Collegio Romano. The main part of the Collegium Romanum library was equally confiscated. It was 'transferred' to the new national library 'Vittorio Emanuele II', which the new government set up in the very same building. During 1874-1875 some 400,000 volumes from over 60 libraries were transferred to it and it was officially inaugurated (still in the same building) on 15 March 1876. Some parts of the original Collegium Romanum collection, however, escaped confiscation in various ways, as we shall see below. Kircher's museum was also confiscated, though his books and manuscripts must have already been moved to the Collegium Romanum library, as suggested above. Since the Voynich MS was one of them, this will receive specific attention in the following. Some of his museum items are now in the Museo Pigorini in the EUR. Only the famous astronomer Angelo Secchi and his observatory (Vecchia Specola) were allowed to stay in the building of the Collegium Romanum. While the main collection of the Biblioteca Maior of the Collegium Romanum was transferred to the new state library, and is presently preserved in the Biblioteca Nazionale Centrale di Rome (BNCR), at least three collections of books (including manuscripts) escaped this confiscation, or at least for a while. The books of two of these collections received typescript labels ex Bibliotheca privata P. Petri Beckx (33). The first of these is a large collection of manuscripts that is closely related with the history of the Society, including letters of the founding fathers and University course materials of Jesuit professors. At the time of the confiscation it would have comprised more than 2000 items, but the exact number is hard to estimate. These may well be the 4000 items that were mentioned above (Carini Dainotti (1956), see note 25). This collection is presently preserved in the historical archives of the Gregorian University (the so-called Fondo APUG). It also includes several items that trace back directly to Athanasius Kircher, for example the 14 volumes of the Carteggio Kircheriano that was mentioned in the catalogue of De Sepi (then only 12 volumes) (34). 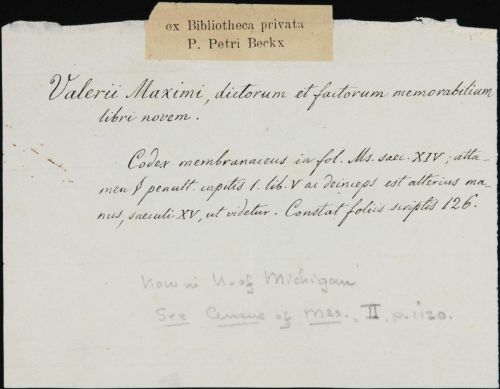 The vast majority of the manuscripts in the Fondo APUG have labels referring to the library of P.Beckx, which are usually glued to the inside cover or one of the first folios. The second is a collection of much older classical and humanist manuscripts. This is the collection that included the Voynich MS. The nucleus of this collection has been sold to the Vatican library in 1912 and is described in Ruysschaert (1959) (see note 3). A few of the illustrated manuscripts in this collection that were acquired by Voynich have been attested in the main library of the Collegium Romanum up to the year 1870. The most notorious of these are a pair of manuscripts originating from the library of Mathias Corvinus (35), which were seen by the Hungarian historian Rómer (36) and a MS of Marcanova, seen among others by Cardinal Angelo Mai (37). So far, I have found no evidence about the exact moves of this collection, but it seems likely that it was in Villa Mondragone in 1911-1912 (38). These manuscripts equally have the small labels referring to the library of P. Beckx. In the case of this collection, they were attached to slips of paper with an older, hand-written bibliograhical description of the work. They may also be observed in the digitised manuscripts of the Vatican library (click on the thumbnail). Many more manuscripts of this collection have been scanned from old B/W microfilms. With only few exceptions, the name of Beckx has been scratched out, an important point that we will come back to below (Section 5.6). The third set of books that was not immediately confiscated was actually hidden in a room inside the building of the Collegium Romanum, the so-called Ripostiglio. An important collection of books and manuscripts was stored in a room in the Collegium Romanum bulding that has become known as the Ripostiglio, and only very few people knew about its existence (39). It is not clear when this was started, and it is still partly clouded in mystery. The room had a hidden trap door, which was discovered four years after the confiscation of the palace, in 1877, and this was immediately reported to the government. The government official Bartolomeo Podestà was tasked to make an inventory, and he wrote a report in which he strongly criticised the Jesuits. The Jesuits on their side responded with indignation. The 1752 most important manuscripts in this collection were moved to the National Library, where they became the Fondo Gesuitico, which still exists with this name. None of the manuscripts from this collection had a "P. Beckx" sticker attached to it. The most valuable item was a Muretus autograph, and it also included five autograph manuscripts of Kircher (40). The less interesting part of this collection was moved to an attic of the same building, the so-called soffitta, and subsequently largely ignored. Many items suffered considerable water damage, and much later, when the room was needed for other purposes, this collection was given back to the Jesuits, who integrated it into the historical archives of the Gregorian University as the Fondo Curia. All three of these collections included manuscripts that used to be owned by Kircher. From remains of shelf marks written on many of these items it is certain that they used to be part of the Bibliotheca Maior of the Collegium Romanum. As already mentioned above, on 15 March 1876 the Vittorio Emanuele II library was officially inaugurated, still at the site of the former Collegium Romanum. In 1879 the Palazzo Peretti, not far from the newly erected Termini railway station, was made available to the Jesuits by Massimiliano Massimo, son of Camillo Massimo. Massimiliano had taught at the Jesuit boarding school at Villa Mondragone. He started a gymnasium and a liceo in the palace, closely modeled after Mondragone. Between 1882 and 1885 Henri Hyvernat (who later moved to the US and knew W.Voynich) was teaching theology at the Gregorian University. In September 1883 Fr. Anderledy was elected as the future successor to P. Beckx, but Beckx still retained the power of the General of the Society. In January 1884 Beckx abdicated in his favour and in May he returned from Fiesole to Rome, accompanied by his faithful assistant Charles Lavigne S.J., who became his secretary. He lived under very modest circumstances in the Belgian College at S.Andrea al Quirinale, even though his friend prince Alessandro Torlonia offered him to stay in his Villa in Castel Gandolfo. There is a heart-warming account of Torlonia visiting Beckx on the latter's 90th birthday (February 1885), with the two old men meeting halfway the many flights of steep stairs to have what may have been their last encounter. Torlonia died in February 1887. While already quite infirm, Beckx was forced to move to equally modest dwellings in Via di San Nicolo da Tolentino, which was also the new location of the German-Hungarian college. Beckx died here at the age of 92. One of Beckx's last activities had been to assign the task of updating and re-issuing the bibliography of all Jesuit works to Carlos Sommervogel. He had already contributed to the first two issues by A. and A. De Backer (1853) (41). For this task Sommervogel was transferred to Leuven (Belgium) in July 1885, where he maintained an active correspondence with many Jesuits, which has been preserved (42). By 1886, he realised that there should exist important references for him, namely bibliographical notes about the Collegium Romanum library made by Beorchia. 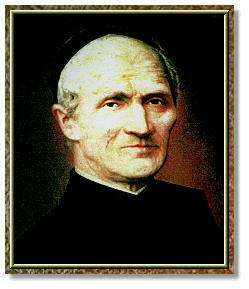 Paolo Beorchia S.J. (1795-1859) was rector of the college of Novarra, and later librarian of the Collegium Romanum library. He was an avid bibliographer, already tasked by Beckx's predecessor Roothaan to prepare a new bibliography of the Soceiety of Jesus. He made many preparatory notes, but this work was never completed. He was not on very good terms with the De Backer brothers, and they did not consult his notes for their bibliography. These notes were contained in the hidden archives of the Society and after some back and forth correspondence, the provincial of Rome (Fr. Ghetti) agreed that Sommervogel could have access to this material. From this episode we know that the archives were stored somewhere in the Roman province (43). Sommervogel did not travel to Rome, but the notes by Beorchia, and additional notes also from from Vittorio Fabriani S.J. (librarian of the Collegium Romanum and of the Gesù - he died in 1869) were sent to him. He was very hapy about their quality and they have been reflected in his work (44). The third issue of the Bibliothèque de la Compagnie de Jésus started appearing in 1893 (45). Like the earlier version by the De Backer brothers, it has a long entry for Athanasius Kircher (46), which describes, besides the numerous volumes he published, also many minor collections of his correspondence. However, the main collection of letters, the 12 volumes of the Carteggio Kircheriano, which was already mentioned in De Sepi (1678) (see note 10), is missing (47). From this we can conclude that this collection was hidden even from Jesuit historians. We may now also come back to the library of the Duchess of Sachsen, or rather the Bibliotheca Rossiana as it is more commonly known. 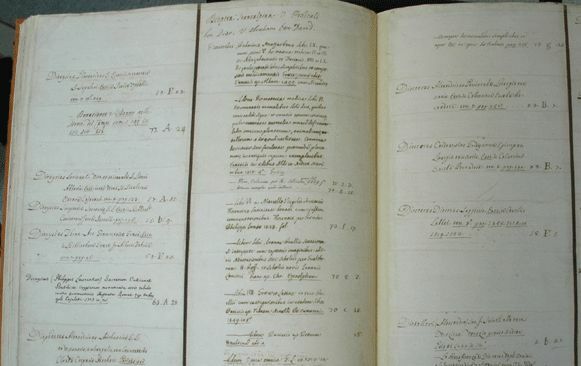 After the move of the library to the Austrian embassy in the Palazzo Venezia, the Austrian ambassador to the Vatican (Alexander Freiherr von Hübner) agreed with Beckx that the entire collection should be transported to Austria, to ensure that the clauses of the donation agreement (as mentioned above) were observed. Initially, possible locations for storage of this collection were explored by both parties, and Malta was proposed by the Jesuits as an interesting option. Several cities in Austria were also suggested, and in the end it was agreed to go for Austria. The cost of the transportation from there to Austria was borne by the Austrian emperor. This transportation took place in 1877, initially to the sacristy of the Jesuit Church near the old University in Vienna. This location soon turned out to be too humid for the valuable collection, so in 1895 the collection was moved to a more appropriate location: the Jesuit College in Vienna’s 13th district: Wien-Lainz. At this time the library contained approximately 9000 items, including 1173 manuscripts, about 2500 incunables and some 5300 mostly valuable later prints. While in Wien-Lainz, the collection was stored on the first floor of the Jesuit College building, in a dedicated room with shelves numbered I to XXIII, where the shelves VII to XI contained the manuscript library. Each book received a shelf mark including this number (e.g. Cod X 88). When Eduard Gollob visited this room (48), he noted that all items had been (re-)bound by De Rossi into similar-looking bindings, in leather with gold pressings on the dorso and the covers. Other manuscripts with a valuable original binding were kept unchanged, but stored in a case with these same features. While in Wien-Lainz, the Bibliotheca Rossiana was open to consultation by scholars, and occasionally books were even lent out. One of its most valuable items, a MS from the library of Mathias Corvinus with the earliest known portrait of him, was lent out to Hungary for an exhibition, after considerable negotiation. It was returned safely. In 1892 the Spanish Jesuit Luis Martin succeeded Anderledy as the new General of the Society of Jesus, while the Curia was still based in Fiesole. 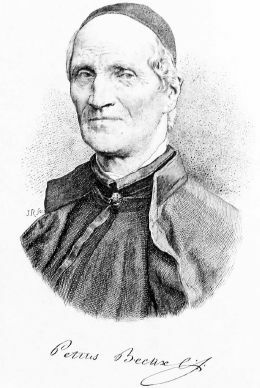 The Jesuit Franz Ehrle, who was Prefect of the Vatican Library, warned about an increasing danger of further confiscations of Jesuit material by the state, and it was decided to secretly move the early archives of the Society from the German college in Rome to the German novitiate in Exaten, in the Netherlands (see note 23). The same ruse was used as in 1873: the items were treated as the private library of the father general. The archivist, Father Joh. Van Meurs, dispatched case after case to different addresses without anybody’s knowledge. In 1895 it was finally considered safe enough for the General and the Curia to return to Rome. Nonetheless, moves of Jesuit archive material continued all the way through the 1920's: the above-mentioned material in Exaten was moved to Valkenburg (equally in the Netherlands) in 1927, because the house in Exaten was ceded to the Franciscans (see note 23). Several collections of Jesuit books and manuscripts were offered for transfer or for sale in the early years of the 20th century. A 1903 catalogue, still preserved in the archives of the Vatican library (49), refers to a sale that was completed only in 1912. From a letter preserved in the Beinecke library (50) we know that in June 1911 a collection of Jesuit books was offered for sale to W. Voynich, by the Jesuit Pometta in Padova. We don't know, however, what this collection consisted of. In 1912 there were also discussions about selling the Biblioteca Rossiana. There was interest in this library both from private collectors and from institutions. This sale was blocked in the end by the conditions of the donation contract. In 1922 the Biblioteca Rossiana was transferred from Austria to the Vatican. From Grafinger (1997) (see note 19) we know that even in 1922 the transfer of Jesuit material, of which the state was considering that it should be the rightful owner due to the earlier confiscations, was still a very sensitive topic. The 1912 sale is documented in Bignami Odier (1973) (51) and in more detail in Ruysschaert (1959) (see note 17). The ownership issues that still existed in 1922 must have been even stronger for this collection, and we had already seen evidence of this above (Section 4.5) since the name of Beckx has been scratched away in the books and manuscripts. This sale concerns the above-mentioned collection of classical and humanist books and manuscripts that originated from the library of the Collegium Romanum, and included the Voynich MS. As we know, Wilfrid Voynich managed to acquire a selection of these manuscripts. The composition of this collection is described in more detail on this page, and its past whereabouts are investigated in more detail here. These details need not be repeated here, but to summarise, it appears that around 1873 the collection may have been transferred either to the Villa Torlonia in Castel Gandolfo, or to the Villa Mondragone in Frascati. At the time of the sale, in 1911-1912 it was most probably in the Villa Mondragone. The related collection of over 2000 Jesuit historical manuscripts (including the Kircher correspondence) was not offered for sale, and was almost certainly preserved in the Villa Torlonia in Castel Gandolfo, until about 1919. With respect to the collection offered by Pometta, neither the composition nor the source of this collection is known, but other book dealers had already shown an interest in it. At present it does not seem likely that this is the same as either one of the collections mentioned above, but this requires further research. In 1915 the Polish Jesuit Wlodimir Ledochowski became the new general of the Society, and under his leadership, two important new centres were established in Rome. One of these is the new Pontificia Università Gregoriana which opened in 1930 on Piazza della Pilotta. It also hosts the historical archives of the University (APUG). These presently include (among others) the Fondo APUG and the Fondo Curia. The Fondo APUG consists of the well over 2000 Jesuit manuscripts (the first collection mentioned above, with the typescript ex libris of P. Beckx). These included among others course material of the Collegium Romanum, the already mentioned correspondence of Kircher, other autograph manuscripts of Kircher, and autographs of many important Jesuits. This collection had been moved to the palazzo Borromeo (German college) in 1919, and is presently still known as the Castel Gandolfo collection (52). This strongly suggests that the collection had been stored there, presumably in the Villa Torlonia in Castel Gandolfo that was already mentioned earlier. The Fondo Curia is that part of the above-mentioned Ripostiglio that was moved to the attic (the soffitta). It was returned to the Jesuits in 1948 (53). In 1929 Ledochowski also initiated the building of the new general Curia in the Borgo Santo Spirito, near the Vatican. This also hosts the new archives, the Archivum Romanum Societatis Jesu (ARSI). The archival documents related to the period after 1824, which were initially kept in Fiesole, were first transferred to Rome, to the German College and then to this newly erected archive in the Borgo (see note 23). With respect to the archives preserved in Valkenburg in the Netherlands, in 1939, when war appeared more and more unavoidable, Ledochowski felt that an imminent invasion of the German army might cause damage to the Archives. Therefore, he ordered them to be returned to Rome. The transportation from the Netherlands to Rome was labelled “Vatican Diplomatic Post.” They were also deposited in the new archive (see note 23). The material that had been confiscated and stored in the Italian state archives was given back to Fr. Tacchi Venturi S.J. in 1924, with the condition that they should be made accessible to scholars (see note 23). These were also transferred to the ARSI. It appears, however, that some items remained in the state archive. In particular, MS 493 of this archive consists of a collection of Jesuit material that seems to trace back to the Collegium Romanum (54). We may draw a graphical representation of the various moves of Jesuit library material, as far as I have been able to find out, and has been presented above. In this illustration, blue boxes refer to Jesuit collections and red boxes to other collections. Orange arrows are 'involuntary' moves, typically confiscations. The boxes for Castel Gandolfo and Mondragone still bear question marks, for reasons explained on this page. Note: this bibliography extends the main bibliography of this site, which may be found here. The present bibliography contains only entries that are relevant exclusively for the topic of this page (55). I have seen and used all references listed below, unless indicated otherwise. Note about sorting order: prefixes like 'De' (etc.) are considered part of the name, and are sorted under 'D' (etc.). Bartòla, Alberto: Alle origini del Museo del Collegio Romano, Documenti e testimonianze, Firenze, Olschki, 2004. Batllori S.J., Miquel: El pare Ehrle, prefecte de la Vaticana, en la seva correspondència amb el cardenal Respolla In: Collectanea vaticana in honorem Anselmi M. card. Albareda a Bibliotheca apostolica edita. Città del Vaticano, Biblioteca Apostolica Vaticana, 1962, 2 vol. (Studi e testi 219-220), vol.1, pp. 75-117. Bignami Odier, Jeanne, avec la collaboration de José Ruysschaert: La Bibliothèque Vatican de Sixte IV à Pie XI, Studi e Testi 272, 1973. Buonanni S.J., Filippo: Musaeum Kircherianum, sive Musaeum a P. Athanasio Kirchero in Collegio Romano Societatis Jesu... descriptum, 1709. Carini Dainotti, Virginia: La Biblioteca Nazionale Vittorio Emanuele al Collegio Romano. Olschki, Firenze, 1956. Chan, Albert: Chinese Books and Documents in the Jesuit Archives in Rome: A Descriptive Catalogue. Japonica Sinica I-IV, 2002. (All information used here is in the Preface of this book). Csontosi, János: Corvinische Handschriften von Attavantes, in: Centralblatt für Bibliothekwesen, 3. Jahrgang, 5. Heft, Mai 1886, pp. 209-217. Csontosi, János: Bildnisse des Königs Mathias Corvinus und der Königin Beatrix in den Korvin-Codexen, Ungarische Revue, 1890, 10. Jahrgang, Budapest. Pp. 177-210. (German translation of a Hungarian paper of 1888). Danieluk S.J., Robert: La Bibliotheque de Carlos Sommervogel: le sommet de l'oeuvre bibliographique de la compagnie de Jesus (1890-1932), 2006. De Berzeviczy, Albert: Két eltünt és újra elökerült Corvin-codexröl : [f. évi junius hó 26-án a Nemzeti Múzeumban meghívott közönség elött tartott elöadás]. Budapesti Szemle, 40. évf. 151. köt., 428. sz. / 1912, pp. 307-311. De Marinis, Tammaro: Manuscrits, incunables et livres rares / Livrairie ancienne, 1913. De Marinis, Tammaro: La biblioteca napoletana dei re d'Aragona, t. 2, Milano, 1947. De Sepi, G.: Romani Collegii Societatis Jesu Musaeum celeberrimum, Cujus magnum Antiquariae rei, statuarium imaginum, picturarumque partem Ex Legato Alphonsi Domini, S. P. Q. R. A. Secretis, munifica Liberalitate relictum. Etc etc. ... exponit Georgius de Sepibus Valesius, Authoris in Machinis concinnandis executor. Amstelodami, ex Officina Janssonio-Waesbergiana, Anno MDCLXXVIII (1678). Del Pinto, G., La Casa Abitata da Volfango Goethe in Castel Gandolfo. Con documenti inediti tratti dagli archivi di Roma. Roma, Officina Poligrafica Romana, 1902. Diamond, J.: A Catalogue of the Old Roman College Library and a Reference to Another. Gregorianum 32 (1951), pp.103-114. Dorez, Léon: Recherches sur la bibliothèque de Pier Leoni, médecin de Laurent de Médicis, in: Revue des Bibliothèques, IV, 1894, pp. 73-83. Dorez, Léon: Recherches sur la bibliothèque de Pier Leoni, médecin de Laurent de Médicis (2e article), in: Revue des Bibliothèques, VII, 1897, pp. 81-107. Ehrle, Franz: Bibliothektechnisches aus der Vatikana, in: Zentralblatt für Bibliothekswesen 33, 1916, pp. 197-227. Findlen, Paula: Scientific spectacle in Baroque Rome: Athanasius Kircher and the Roman College Museum. In: Roma Moderna e Contemporanea, anno III, no. 3, 1995, pp. 625-65. Garrucci, Raffaele: Origini e vicende del Museo Kircheriano dal 1651 al 1773. In: La Civiltà Cattolica, ser. 10, Vol. XII, 1879, pp. 727-39. Ghiron, Isaia: Vita di Vittorio Emanuele, Agnelli, 1882. Gollob, Eduard: Die Bibliothek des Jesuitenkollegiums in Wien XIII. (Lainz) und ihre Handschriften. Vorgelegt in der Sitzung am 14. Oktober 1908. Golvers, Noel: Ferdinand Verbiest S.J. (1623-1688) and the Chinese Heaven. Leuven University Press, 2003. Grafinger, Christine Maria: Eine Bibliothek auf der Reise zwischen Rom und Wien. Eine Darstellung der Geschichte der Bibliotheca Rossiana, in: Beiträge zur Geschichte der Biblioteca Vaticana (Studi e Testi 363) Città del Vaticano 1997, pp. 95-146. Journal de Lyon, issue of 29 October 1873, transcribed and translated here. Kristeller, Paul Oskar: Iter Italicum, A Finding List of Uncatalogued Or Incompletely Catalogued Humanistic Manuscripts of the Renaissance in Italian and Other Libraries Vol.2, Italy, Orvieto to Volterra, Vatican City; 3rd edition, 1998. Lo Sardo, Eugenio (ed.) : Athanasius Kircher S.J., Il Museo del Mondo, Edizioni de Luca, 2001. Martina S.J., Giacomo: Il Collegio Romano: 1824 - 1873. In: Roma Moderna e Contemporanea, anno III, no. 3, 1995, pp. 667-691. Pócs, Dániel: Egy corvina története. Battista Spagnolli Mantanovano: Pathenice Mariana (Pontosításokkal a Pierpont Morgan Library M496 és M497 jelzetü corvináinak provenienciájához). In: arshungarica 43 vol.3, 2017, pp.301-354. >>available on-line. Renzi, Paolo: I libri del mestiere: la "Bibliotheca Mureti" del Collegio Romano, Firenze : La nuova Italia, 1993. Rómer, Flóris: Díszlapok a római könyvtárakban örzött négy Corvincodex-ból, Lefényképeztette a vaticani zsinaton jelen volt magyarországi püspöki kar. 16 fényképp. (Iv. 13 l.) Pest, 1871. Athenaeum ny. Ruysschaert, Mgr. José: Codices Vaticani Latini, Codices 11414-11709, Schedis Henrici Carusi Adhibitis, Recensuit José Ruysschaert, Bibliothecae Vaticanae Scriptor, MCMLIX (1959). The most relevent parts are transcribed here. Ruysschaert, Mgr. José: Nouvelles recherches au sujet de la bibliotheque de Pier Leoni, Médecin de Laurent le Magnifique. Bulletin de la Classe des Lettres et des Sciences morales et politiques de l’Académie Royale de Belgique, 46 (1960), pp. 37-65. Sommervogel, Carlos and A. and A. De Backer: Bibliothèque de la Compagnie de Jesus, 1893. For Kircher, see Vol. 4, cols. 1046-77. Spotti, Alda: Guida storica ai fondi manoscritti della Biblioteca Nazionale Centrale Vittorio Emanuele II di Roma, "Pluteus", 4-5 (1986-7). Tietze, Hans: Die illuminierten Handschriften der Rossiana in Wien-Lainz, (Beschreibendes Verzeichnis der illuminierten Handschriften in Österreich 5), Leipzig 1911.
van Mater Dennis, Holmes: The Garrett Manuscript of Marcanova, in: Memoirs of the American Academy in Rom, Vol.6 (1927), pp. 113-126. Verstraeten S.J., A.M.: Leven van den Hoogeerwaarden Pater Petrus Beckx, XXIIe Generaal Overste van het Gezelschap van Jezus, Antwerpen 1889. Villoslada S.J., R. Garcia: Storia del Collegio Romano, dal suo inizio (1551) alla sopprezzione della Compagnia di Gesu (1773), Analecta Gregoriana, Roma, 1954. Weinberger, Dr. Wilhelm: Beiträge zur Handschriftendkunde. I. Die Bibliotheca Corvina. Philosopisch-Historische Klasse. 159. Band, 6. Abhandlung, 1908. With some possible, even when highly unlikely exceptions, for example if this leads us to a discovery of the lost notes of Barschius, that were sent by Marci to Kircher, together with the book. See the translation of the 1665 letter from Marci. The evidence that the collection was never 'lost' was found in 2015, and is presented in the course of this page. See also section 5.6 of the present page. This is one of the manuscripts described in Ruysschaert (1959). See Renzi (1993). The catalogue includes books issued before 1585. I have searched this publication for the famous Marcanova MS that originates from his collection, was in the Bibliotheca Maior, later came into the hands of Voynich and was sold to Robert Garrett. I could, however, not find it, nor did I find any old manuscripts. I am still hoping to understand this better. I am grateful to Dr.essa Breccia for her kind help and advice when I consulted these catalogues in May 2012. The dating of the alphabetical catalogue is provided in Diamond (1951). I am grateful to Irene Pedretti and Lorenzo Mancini for many useful exchanges and for allowing me to visit the archives. A discussion of the shelf marks >>may be found here. I would like to draw your attention to the excellent site about Vasi's etchings of Rome, >>by Roberto Piperno. See for example Spotti (1986). Sources I have used are (in order of importance): Bartòla (2004), Garrucci (1879), R. Garcia Villoslada (1954) and Lo Sardo (2001) pp.257-260. Finally published in De Sepi (1678). From an >>online publication: "Giorgio De Sepi, Il Museo del Collegio Romano di Athanasius Kircher", (scriptaweb online publishing), unknown author (2006). This is preserved in the historical archives of the Pontifical Gregorian University in Rome, as APUG 35 VII (g), and has been described in detail in Garrucci (1879) and Bartòla (2004). Garrucci gives the year 1716 for the note by Buonanni. Lazzari (1754-1757), which is also mentioned by Ruysschaert (1959), where he indicates that it hardly refers to the MS collection that the Vatican acquired from the Jesuits. I have been able to consult it only briefly, and will need to go back to it. See >>the blog of the historial archives of the Gregorian University in Rome (in Italian). For more details see also here. Although the one that should have been attached to the Voynich MS has not been preserved. The most important reference for this is Grafinger (1997). A special aspects of his library is that he rebound all prints and manuscripts in a cover of a consistent design. As an unfortunate consequence of this, a lot of provenance information is lost. This is reported in Romer (1870). This is the Didymus MS which is included in this table as MS J22. This letter was first brought to my attention by Xavier Ceccaldi, through his web publication. The original text of the entire letter (in French) is also transcribed there. The letter is preserved in the Archivio della curia generalizia della Compagnia di Gesù, ARSI, Rom.35.VIII.6). The text of the letter has been published on several occasions, e.g. : Martina (1973) (the original French text), Bizzocchi (1973) (Italian translation) and Verstraeten (1889) (Dutch translation). The 60 chests are most probably the library of the Duchess of Sachsen, also known as the Bibliotheca Rossiana. I am grateful to Michele Smith for this reference. Details from an article in the Journal de Lyon, which has been transcribed and translated here. Modern Poli. The villa, known as Villa Catena, was later acquired from Torlonia by Dino de Laurentiis. It is presently in a bad state. According to sources in the Archives of the Gregorian University (APUG), these collections were most probably already removed before, and the labels were added later as an additional safety measure. P.Beckx' private library should therefore perhaps be considered more of a 'virtual library'. The Carteggio Kircheriano comprises volumes APUG 555 - 568. Other manuscripts of Kircher are APUG 765, 769, 812, 830 and 1053. They all appear to be Kircher autographs. These two manuscdipts are identified in the table of manuscripts as J20 and J22. See Romer (1870). They are further described in subsequent Hungarian publications, e.g. Csontosi (1881) and Csontosi (1886). This MS and its history are described in detail in van Mater Dennis (1927). For details see this page. Namely the present MS Ges.546, Ges.561, Ges.562, Ges.1235 and Ges.1331. De Backer (1853). The brothers Augustain and Alois De Backer were Belgian Jesuits. This correspondence is descibed in Danieluk (2006), which is the main source for these events. I am grateful to Noel Golvers for pointing out this source, and for many other helpful suggestions. The Roman province included the city of Rome, Frascati, but also Florence/Fiesole. I personally believe that the most likely location was the Collegium Germanicum. See also Danieluk (2006). It is not possible to positively identify the author of the bibliographical descriptions on the paper slips attached to the Collegium Romanum manuscripts sold to the Vatican and to Voynich, but it is not unlikely that these would be from the hand of Beorchia. See Sommervogel and De Backer (1893). In Sommervogel, Kircher's works are described in Vol. 4, cols. 1046-77. As described here, Voynich's employee Herbert Garland consulted De Backer (1853) precisely in order to learn about Kircher's correspondence. As described in Gollob (1908). It has the shelf mark Arch.Bibl.109. It is described in more detail here. The letter is discussed here. From the staff at the historical archives of the Gregorian University (priv.comm.). >>see also here. From a >>web article by the Gregorian University in Rome. From Golvers (2003). This item is also discussed in Lo Sardo (2001). Common references are included in the main bibliography. The present page also includes references of relevance for the closely related pages about the location of purchase by Voynich, the precise list of manuscripts he acquired and the adventures of one Aristotle MS.